Yosemite’s Apple Blossom Inn Bed and Breakfast…. A unique & romantic Bed and Breakfast Inn situated on 5.5 acres near Yosemite National Park, California in the Sierra foothills. Located in the midst of an organic apple orchard, spa and gardens, special care is given to guest privacy as rooms are situated in a way that it may seem that you have the whole house to yourselves. Innkeeper, Candy ‘Apple’ Arthur, has her own home on the property and is always available to tend to the needs of her guests. Guests often spy wild turkeys, deer, foxes, ravens and other wildlife during their relaxing stay. Gourmet Candy ‘Apple’ Breakfasts are served each morning in the ‘Deliciously’ decorated dining room, with Apple decor throughout, or out on the sunny deck with a view of the Sierras, always featuring Candy’s own recipes. 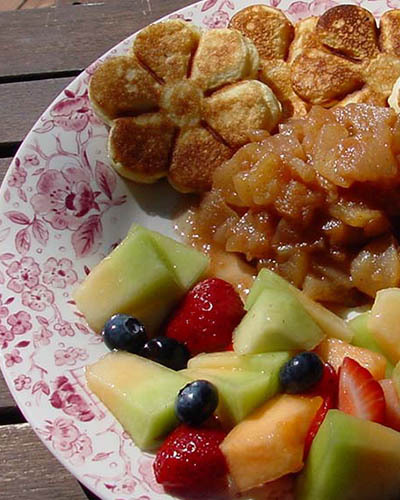 Guest favorites include Apple Blossom Pancakes, Candy Apple French Toast, Cheesy Apple Blossom Quiche and Banana Blossom Waffles with Apple Cider Sausages. Breakfasts always include fresh local and organic fruits, sometimes apples grown in the orchard, juices, coffee, teas, milk, yogurt, cereals and breakfast breads. For a real treat, try some of our delicious organic Apple Blossom honey from our bees in the orchard! The “Deliciously” decorated guest rooms are all done in country cottage styles, and each is named for apples or blossoms in the organic orchard. The newly renovated Apple Blossom, Granny Smith and Red Delicious rooms are all individual rooms with private baths, entries or balconies in the main house, and all have luxurious linens and robes. The Golden Delicious Suite is located upstairs in the separate Carriage House, and has two bedrooms with a shared bath. A truly unique Yosemite lodging experience while vacationing in California’s Gold Country. Pet friendly rooms available upon request. After a busy day visiting the many wonders and beauty of Yosemite National Park, we offer our guests a peaceful nights rest in a quiet country setting. Upload pictures of Yosemite to loved ones using the Inn’s free high speed and wireless internet access. The Inn sits on a mountain ridge overlooking the Oakhurst Valley and out at California’s High Sierras. Stay at the romantic Yosemite Bed and Breakfast, The Apple Blossom Inn for the perfect Yosemite lodging and accommodations while vacationing at the magnificent Yosemite National Park . Ask about our Yosemite Picnic Packs! 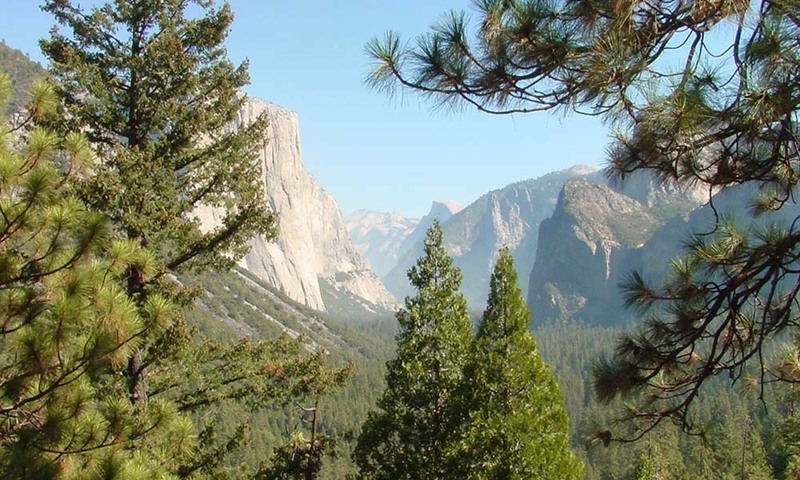 Enjoy the beauty and natural splendors of Yosemite National Park for a two night stay at the award winning Apple Blossom Inn. A unique & romantic Bed and Breakfast Inn situated on 5.5 acres near Yosemite National Park, California in the Sierra foothills. Located in the midst of an organic apple orchard, spa and gardens, special care is given to guest privacy as rooms are situated in a way that it may seem that you have the whole house to yourselves. Innkeeper, Candy 'Apple' Arthur, has her own home on the property and is always available to tend to the needs of her guests. Guests often spy wild turkeys, deer, foxes, ravens and other wildlife during their relaxing stay.